Reginald Smith Brindle came relatively late to composing, having initially taken up the guitar – well enough to win a Melody Maker prize in the 1930s – and then found his way into jazz. Parental pressure led him to study as an architect in order to earn a living, acquiring intermediate RIBA qualifications. An organ recital in Chester Cathedral in 1937 revealed to him his true destiny as a composer. The outbreak of war put a break on his ambitions, but during its latter stages, serving with the Royal Engineers, mainly in North Africa and Italy, he began to compose for the instrument he knew best, the guitar (he was also an able player of the piano, clarinet and saxophone). A stream of nearly 40 short guitar pieces poured from his pen between 1944 and 1952 – 10 of these in 1948 – a body of work unmatched in quality by any other British composer. In 1949 he returned to Italy to study, first in Rome with Ildebrando Pizzetti – whom he found too outmoded – then in Florence with Luigi Dallapiccola, whose opera Il Prigioniero was a formative experience but whose teaching methods exasperated him. He became an active member of the Scuola Dodecafonica alongside Bruno Bartolozzi, Sylvano Bussotti and Alvaro Company, his music consequently undergoing a radical expansion of scale and intellectual rigour with a series of major orchestral works – the Sinfonia of 1954, Variations On A Theme By Dallapiccola (1955), An Epitaph For Alban Berg (1956) and Symphonic Variations (1957). Smith Brindle’s output of chamber and vocal music, limited in numbers but not quality, also began about this time. 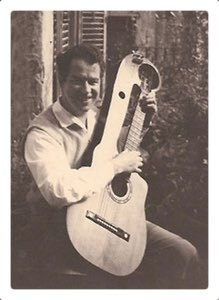 His output for solo guitar had reached its peak with El Polifemo de Oro (1956) – Julian Bream’s 1966 recording of which has been Smith Brindle’s often solitary toehold in the recording catalogue. He then branched out with pieces for guitar in duet with other instruments plus works for string quartet, wind quintet and a Concerto For Five Instruments And Percussion (1960). His early vocal pieces from the time betray a debt to Dallapiccola both in word setting and instrumental layout, reaching a climax with his opera The Death Of Antigone (1969, first produced in Oxford two years later), the choral Windhover (1971) and A Mass In English (1974). The late 1950s saw the influence of science and science fiction appear in his work, a trait sustained over the ensuing years in works such as Cosmos (1959), Homage To HG Wells (1960), Andromeda – a flute solo from 1966 – and the percussion works Orion M42 and Auriga (both 1967). In 1970, he relaxed the strict serialism of his musical idiom to allow for more melodic and emotional invention, a development – ahead of most of his contemporaries – for which he felt no need to apologise. His later works saw a resumption of composition for guitar – including five sonatas – and organ, many of the latter with evocative Latin titles. The zenith of this final phase was reached in his Second Symphony, Veni Creator (1989), but he kept working, even helping to found the Chameleon Group of Composers, based in Croydon, in 1995. He ceased composition in 1999. As a writer, he made a great impression in the heady avant-garde days of the 1960s and 1970s with a series of books for Oxford University Press: Serial Composition (1966), Contemporary Percussion (1970) and The New Music (1975), in which he proved an eloquent advocate for the more advanced trends in 20th-century music. A fourth book, Musical Composition, followed in 1986. He was a distinguished teacher, highly regarded by his students. He lectured for 10 years from 1957 at University College of North Wales, Bangor (where he had studied from 1946 to 1949), until he was made a professor. From 1970 he was head of the music department at the University of Surrey, founding the prestigious Surrey Tonmeister degree, unique in the UK, blending rigorous musical study, advanced investigation of audio engineering and mastery of sound-recording operation and practice. The programme enjoys superb links to, and reputation within, the industry. Smith Brindle retired from teaching in 1985. He continued writing music, completing his Symphony No.2: Veni Creator in 1989 and further adding to his guitar, and to a lesser extent, his organ repertoires. Among the “strings to his bow” was his painting. Having studied watercolours at the Newlyn School in the 1930s, he moved on to using all the various mediums such as oils and acrylics. From the extremes of abstract art, he latterly returned to his favourite style – watercolours and ink landscapes and archirectural buildings. He exibited in various local galleries.